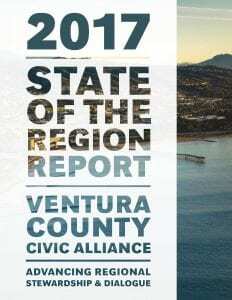 The Ventura County Civic Alliance, an initiative of the Ventura County Community Foundation, has released its 120-page 2017 State of the Region report — an all-encompassing overview of the highs and lows of Ventura County. The report, which analyzes the county’s economy as well as social, health and environmental issues, was compiled by a team of independent researchers led by California Lutheran University Professor Jamshid Damooei, chair of the Department of Economics, Finance and Accounting, and was written by freelance journalist Tony Biasotti. Compared to other neighboring counties, job growth continues to be an ongoing issue for Ventura County. The report notes that between 2006 and 2010, Ventura County shed more than 23,000 jobs, or around 8 percent of its non-farm workforce. It is anticipated in 2017 that the county will barely top the number of non-farm jobs it had in 2006. By contrast, Santa Barbara County topped its pre-recession job total in 2013. In addition, the current report cited serious job creation issues that are exacerbated by rising housing prices and population growth. The county’s homeless population continued to decline in 2016 to 1,271 individuals, a 10.3 percent drop from the prior year and a 42 percent decline from 2009. The report stressed that despite the difficulty in obtaining an accurate number, progress is being made on the war against county homelessness. The environment continues to make strong steady improvements. Ventura County’s air and ocean water have gotten cleaner, and the drought is less worrisome in most areas of the region. Also of importance is that residents are using less power per person, and more of the power used is solar. Despite being California’s third-safest large county (behind San Diego and San Mateo), local crime rates have seen a slight uptick since 2012. Despite this nominal increase, the long term trend in Ventura County, as well as the state, is a continuing decline in the crime rate. Lagging behind the state average of $6,000 in local donations per resident, the 2017 report revealed that Ventura County’s nonprofit organizations take in 50 percent less ($3,150 per resident) than their counterparts in Los Angeles County ($6,060 per resident) and more than 60 percent less than those in Santa Barbara County ($8,235 per residents). Local nonprofits would need to see a 90 percent increase in donations to reach the state average. Donations to local nonprofits would need to increase more than 90 percent even to reach the state average of $6,000 per resident.